— is a unique skill-building DVD/book program that prepares students for college success. "The best preparation for college success is practicing with The Real Thing." 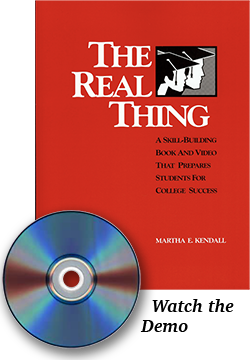 The Real Thing DVDs contain fifteen college classes, each 10-15 minutes long. They show authentic teacher/student interactions in a wide range of courses typically taken by first-year students. The book uses the lectures to teach skills vital to students' success at an American college or university. It contains practical study tips, suggestions about how to interact with the professor and classmates, sample discussion topics that call for students to generate original opinions, and examples of real quizzes the professors gave after their lectures. Who benefits from The Real Thing? Overseas students preparing for study in the U.S.
How do students use The Real Thing? How will The Real Thing meet your students' needs? A. The Real Thing gives students hours of practice with authentic college lectures. The book guides listeners, emphasizing key point recognition, summarizing skills and test preparation. A. The Real Thing teaches students to ask questions, think critically, synthesize ideas and defend opinions, verbally and in writing. A. The Real Thing teaches students how to take notes efficiently, and then how to organize, study, and learn from them.